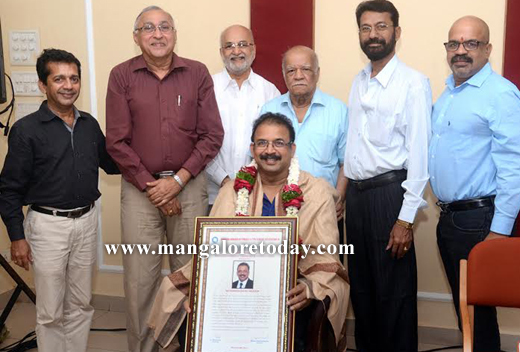 Mangaluru, Dec 12, 2015: Dakshina Kannada Automobile and Tyre Dealers Association felicitated the newly installed President of Kanara Chamber of Commerce & Industry (KCCI) Sri Rammohan Pai Maroor at a function held at Mangalore Club on Wednesday, 9th December 2015. (Left to Right) Association Secretary Sri K. Vilas Kumar, Vice President Sri Kasturi Prabhakar Pai, Patron Sri K. G. Shenoy, President Sri Maroor Padmanabha Pai, Joint Secretary Sri R. P. D’souza and Treasurer Sri Shashidhar Pai Maroor were present on the occasion along with many members, guests and invitees. Sri Rammohan Pai Maroor is an automobile spare parts dealer and an active member of Dakshina Kannada Automobile and Tyre Dealers Association. In its felicitation citation, the Association expressed support to Sri Rammohan Pai Maroor in providing visionary leadership to KCCI, which is one of its affiliated parent bodies.